It’s a nuisance and a noise violation, especially to the partner of the person who has the problem. It’s even worse when it’s an irritant to children or guests who sleep in a different room. Marriage is all about perseverance, and being there for each other through sickness and in health right? But nobody said anything about snoring! The lack of sleep is just unacceptable, especially when there are small children to take care of, who are often awake in the middle of the night too. Once a person loses out on sleep, such as the person snoring, or their partner (mostly the partner), they are more prone to fatigue, stress, being emotionally tangential, and making poor decisions throughout the day. While the partner of the snorer is very aware of their sleep however, the snorer is probably not aware that their quality of sleep is lacking as well. Let’s say, the wife is dealing with her husband who has a snoring problem. She is feeling frustrated that she can’t sleep, and possibly is upset with her husband who appears to be sleeping soundly as he makes those awfully loud noises that sound more like an animal meeting a siren than a human. He comes out of the bedroom, commenting on how well he slept, and the wife mutters a small growl under her breath. Hearing this tone, his attitude suddenly shifts to annoyance, since to him she is being ill-tempered for no reason, and they inevitably start fighting. 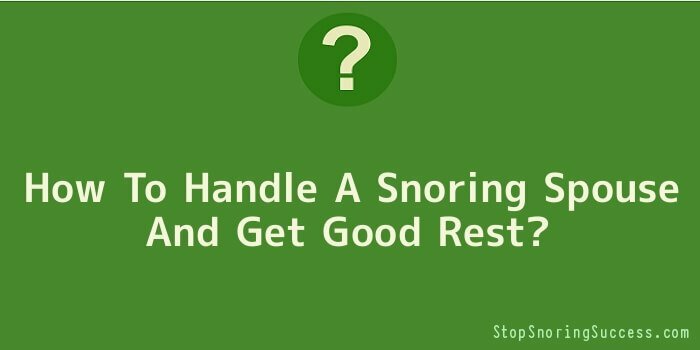 How To Handle Sleeping With A Snorer? It is best for the wife to turn her husband on his side when she hears him snore. While some people may suggest that he sleeps on his stomach, this is actually not a good idea, because this may compromise his airway, which is already partially blocked by the snore, and possible loss of breaths in between snoring. Furthermore, avoiding snore enhancers, such as alcohol, and late night munching, are good preventative measures to take for snoring. Placing a pillow behind his back, or an object that would make him too uncomfortable to lay on will also cause him to revert to his side, so the wife can be rest assured (literally) that she can finally sleep through a night. Is The Snoring Level Really Severe? Snoring could be more than just a frustration; rather, it could be a more serious condition if left untreated. It is important to seek medical advice and follow through with the proper tests, which is usually a sleep study, if he meets the criteria for a condition called sleep apnoea. The family doctor would make a referral to a specialist, who would schedule a sleep study, so that the husband could be monitored overnight by medical professionals, for the severity of snoring, and if or how long he stops breathing in between. People are especially at risk for sleep apnoea when they have obesity. This is a scary condition to have because the person stops breathing in the middle of the night. It is especially scary because obesity or other compromising airway conditions such as asthma, or if the person is a smoker, increases the risk of the snorer with sleep apnoea to go into a complete respiratory failure. How To Cope With Sleep Apnoea? If the husband is diagnosed with sleep apnoea, he will need to use a Continuous Positive Airway Pressure (CPAP) breathing device, which does just that. It is a breathing mask connected to tubing and a machine, which delivers oxygen at a higher pressure, known as positive pressure that helps to inflate the airways so that they stay open longer, and don’t collapse. A common concern that people have when using a CPAP device, is that it is too loud. If the wife is still staying up all night due to the CPAP, it may be time to discuss sleeping in separate rooms, for the sake of quality of life that is affected by lack of sleep. If that is not an option, the machine can be spaced further away from the couple as long as the mask is still on him, and he is receiving the oxygen. A sound proof box for the CPAP may also be available, and possibly covered by insurance. The benefits of using the CPAP definitely outweigh the risks. With this machine, the couple is sleeping better, and feeling better during the day. The husband will also be breathing better. The alternative is none good, and may result in hospitalization and ventilation, or worse. Therefore, the answer is simple: Use the CPAP machine.